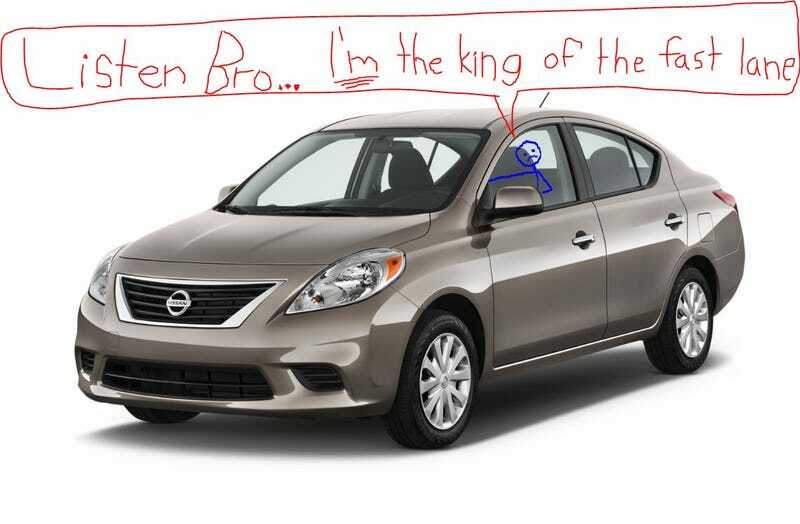 Once upon a time, there was a sad man in a Nissan Versa. The fast lane was his domain. Though many challengers lined up behind him, he was loath to relinquish the throne. Finally, one contender moved into the center lane, and attempted to pass the sad man, who fought tooth and nail to prevent this. Alas, he did not have the power of the contender’s V8, but what he did have instead was determination. Upon hearing this alarming noise, the sad man slammed on the brakes, slowing down so rapidly that he immediately became a tiny spec in the Q ship’s rear-view mirror. Neither the sad man nor his versa were seen or heard from ever again.